First birthday cake for baby is actually maple syrup cupcakes. They’re naturally sweetened and the coconut whipped cream is so good! I’m re-sharing this recipe, and my sweet baby is now 2, not 1. All the tears. That Mom that makes her kid a naturally-sweetened first birthday cake. Ugh. I kinda hate myself for this, except…these maple syrup sweetened cupcakes are DELICIOUS. 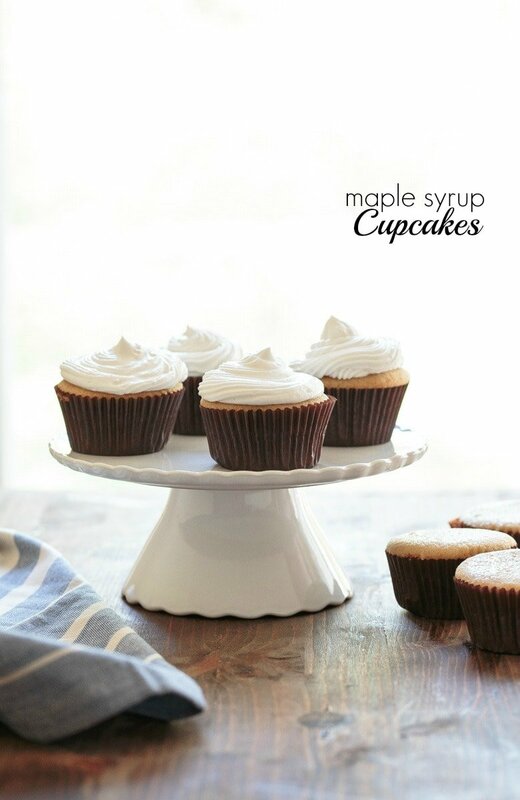 You won’t even notice they’re not ‘normal’ cupcakes…you’ll just notice the deep maple flavor. Even the raw batter is lick-able. I like to think of them as ‘better for baby’ babycakes. Is the maple syrup sweetened coconut whipped cream on top too far? Wait, don’t answer that. So, let’s back up. I’ve told you before that I didn’t read any parenting books before Camille was born. I only read books about how French children eat. Books like ‘Bringing up Bébé‘ and ‘French Kids Eat Everything.’ All I knew is that I was NOT going to have one of those kids that only eats white foods. No no no. And I would never bring my kid to your house for a dinner party and pull out goldfish crackers and fruit snacks for Camille to eat instead of the homemade dinner you lovingly made. No no no again. Anyway, those books told me that when you deny kids something (like sugar), they want it all the time. A little bit of the real thing in moderation sets them up for a lifetime of healthy eating habits. And I’ve been denying her sugar anyway. I just can’t do it. She’s such a good eater; I’m worried she’ll stop eating her vegetables once she tastes sugar. Truthfully, that is what’s holding me back. When she was 7 months old, I was licking an ice cream cone with her on my hip. She leaned in for a lick. She enjoyed it, but didn’t beg for more. Then, when she was 10 months old, I was making oatmeal cream pies from my cookbook, and she was parked on my hip while I was smooshing the marshmallow filling between the cookies. Out of nowhere, she just went for it. Both hands grabbed that cookie, and she knotted up her fists around it and started shoving it in her mouth as fast as she could. I couldn’t really do anything but laugh. I felt like she earned it because she fought for it so hard and held it so tightly in those sweet little fists. I let her eat about 1/2 a cookie sandwich, which if you’re doing the math (and I totally am), it was a whole cookie plus marshmallow filling. And I stressed about it so much. I tried to get over it. Then, at 11 months, I was eating this caramel carrot cake during snack time and she was eating something boring like peas. I gave her 3 little bites of the cake without the frosting. She liked it, and asked for more. And here we are. Maple syrup-sweetened cupcakes for baby’s first birthday cake. Well, at least it’s not whole wheat or gluten free, ok? I want her to know what real cake tastes like, after all. But side note: I did make these cupcakes for a kid’s second birthday and used white whole wheat flour, per request. It totally works here, but they do taste kinda blah because of it. When I make it with regular all-purpose flour, they taste like a real cupcake that you would buy at a bakery. Yes, they are that good. The frosting? It’s nothing but whipped coconut cream and maple syrup. And it’s so good, I’d eat it off a shoe. I actually add it to my tea lattes during the afternoon sometimes. I’m still feeling guilty, 600 words later. My best friend Esther made her kid a watermelon cake frosted with yogurt and decorated with blueberries for his first birthday cake, and well, bless her heart. I think it’s neat. Esther’s kiddo had never had a drop of sugar on his first birthday. He probably still hasn’t! I wish I could be more like Esther. But I’m not. I’m a sugar pusher, baked-good peddler, making-my-living in the sugar bin gal. And it’s time Camille found out. My little Southern evangelist, she is. Naturally sweetened maple syrup cupcakes for baby's first birthday cake! Preheat the oven to 325, and line 8 cups in a muffin pan with cupcake liners. In a medium bowl, beat with an electric mixer the melted butter and oil. Stream in the maple syrup and keep beating. Next, add the egg and beat until combined. Sprinkle the flour, baking powder and salt evenly over the batter, and beat just to combine for a few seconds, then add all of the milk at once. Beat everything until smooth, scraping down the sides of the bowl as you go. Divide the mixture into the prepared cups. To make the coconut cream, you really should refrigerate the can overnight. And the bowl. 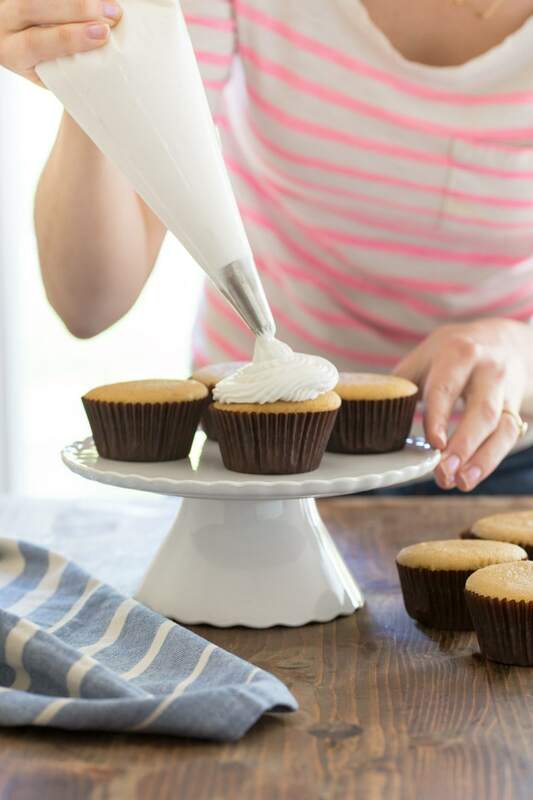 When the cupcakes are totally cool, make the frosting: scrape all of the coconut cream out of the can and into a cold bowl (do not add the little bit of coconut water or juice in the can--just the thick, white cream). Beat with an electric mixer on HIGH until light and fluffy. Add the maple syrup, and beat to combine. Taste the frosting--if you want it sweeter, you're going to have to add powdered sugar because any more maple syrup will make it too thin. Sorry, bub. If you don’t have grapeseed oil can it be change for another oil. Sure, Eve! Anything neutral-tasting, like canola, vegetable, etc. What’s the function of the oil? Why not just more butter? Honest question. I really don’t care to eat oils refined enough to have no flavor, but I’m sure you have a good reason for using it, and I just don’t know what it is. Do you mean oil in the cake recipe? For moisture. For flavor. It won’t taste good without it. Happy 1st Birthday!!!!!! 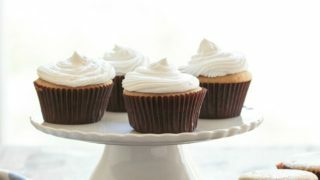 These look delicious, is the coconut cream make the frosting really coco nutty? I’m not a coconut fan. Yeah, it definitely tastes like coconut, but maybe not overly so. I’m thinking if you added at least 3/4 teaspoon of vanilla extract, you might be able to ‘drown’ it out. Enjoy! No not already!!! Since we’re a pricessed sugar free household. We’ll be trying this one soon! Happy birthday Camille!!! Sorry. *edit to processed please! So adorable! I understand your fears…I NEVER gave my two sodas, not ever. My 34 year old daughter drinks *gasp* Dr Pepper way more than is healthy. My 24 year old son doesn’t drink soda at all. One drinks alcohol, one doesn’t. One LOVES vegetables and one won’t touch fruit. Both are healthy active adults. Your influence will only go so far but the beauty of it is that you will love and adore them no matter what! Happy 1st Birthday to your Camille! That’s great to hear :) Thanks, Devona! Thank you so much for all your baby food recipes! I have a10 month old so this is perfect! I am also making all her food and keeping everything simple, low salt and sugar. Thanks! That little face…that adorable little face… is to die for. 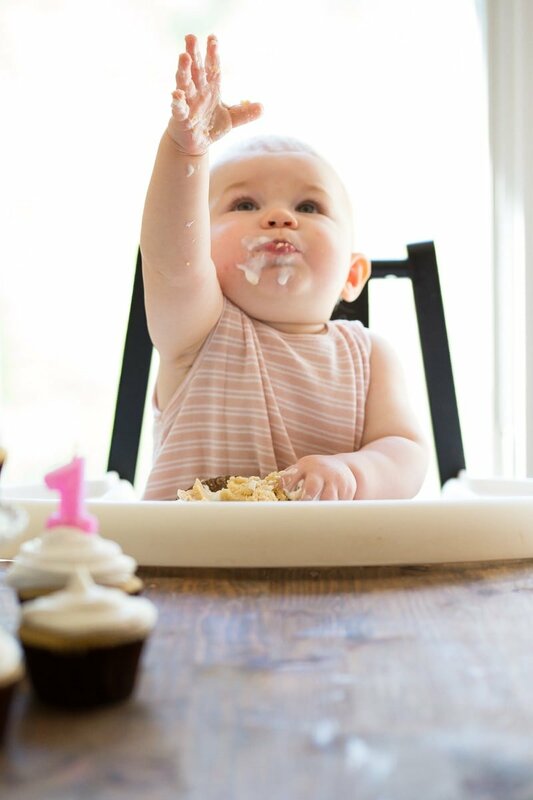 It is hard to believe a year has passed and just look at her…sugar or no…she looks to be a happy, well nourished, precous little girl.I imagine she had the best time eating her cupcakes! Love the newest baby recipe! I am making a batch now (with sprinkles because funfetti…) My 11 month old loves your recipes, especially the “baby bolognese.” Thank you for sharing and happy first birthday to your little one! I try to view it as: I want my children to enjoy a wide variety of mostly healthy foods. Moderate sugar consumption is part of that but by no means is it the whole picture. I’m happy that my boys, 4 and 1.5, are game for trying anything I cook, and I cook a lot, meals that adults enjoy, global cuisine with lots of flavorful herbs and spices and tons of onions and garlic! They eat a wide variety of vegetables and any kind of fruit! Some days my preschooler asks for an apple for dessert! But on the other side of it, even though I was successful at avoiding sugar the first year and keeping it mostly restrained afterwards: there are so many other ways to feel like failing at family food as a mom. My oldest is a nut for macaroni and cheese. When I make it at home (maaaaaybe once a month, even though he asks for it twice a week) it’s on the lighter side, with lots of pepper as well as some garlic and mustard instead of a heavy bland creamy caloric bomb, so I don’t feel too terrible. If we are ever at a restaurant for a meal, though, it’s the only thing he wants. He can’t read yet but he pores over menus for the ampersand and points to it, assuming that if says “&” the whole item is “mac & cheese.” (He’s usually right.) And forget spinach or kale! “I don’t eat leaves,” he’ll grump, like I tried to feed him goat food or something. My youngest is a typical toddler in that he LOVES crackers of any sort and ADORES to dip things in ketchup. Anything – sweet potato oven fries, spinach leaves, the aforementioned crackers, his fingers, probably gym socks if I ever decided to serve them. I strive for balance but I’m not sure how well I’m doing and I probably won’t know until they are adults, making all their own food choices. “I don’t eat leave” Haha, love it! Happy Birthday Camille – your mommy is a genius isn’t she! I am definitely printing off this recipe. I originally started printing off mommy’s recipes and placing in plastic sleeves, but now I’m on a roll and have to purchase a binder, hurrah for mommy. I’m going downstairs right now and baking the almond butter cc cookies. I also bought mommy’s both cookbooks, she is that good. I am now an old grandmother but I was given a piece of advice from a baby health nurse when my first child was going through the not-eating stage. She said if a child was offered good healthy food and chose not to eat it, don’t worry and don’t give in to demands for other types of food. No child for whom food was on offer ever died of malnutrition – they all eat when they get hungry enough. On the other hand when I was small my father insisted I eat spinach/silver beet which he loved. I hated it and it got to the stage when I gagged every time a forkful got near my mouth and it still happens. My son hated brussels sprouts when he was little but now loves them because, I believe, he was never forced to eat them. The bottom line is: everything including sugar in moderation, offer healthy food and refuse to substitute other things eg sweets, candy etc, and don’t force a child to eat something he/she clearly doesn’t like. ahhh i wish you were really that mom and those cupcakes were GF so I could come over and raise my hands to the lord with camille!! (best picture ever). my mom was the exact same way, and lucky for me, my grandmother would feed me bites of ice cream whenever she wasn’t looking. because of this, my first word was “mo.” Meaning, more ice cream. I made these cupcakes today (minus the frosting) and they were simply delicious. Thanks for such a great recipe which I will be using again & again. PS: Forgot to say I made these cupcakes gluten free using rice flour and gf baking powder – worked perfectly! Any thoughts on making these dairy free? 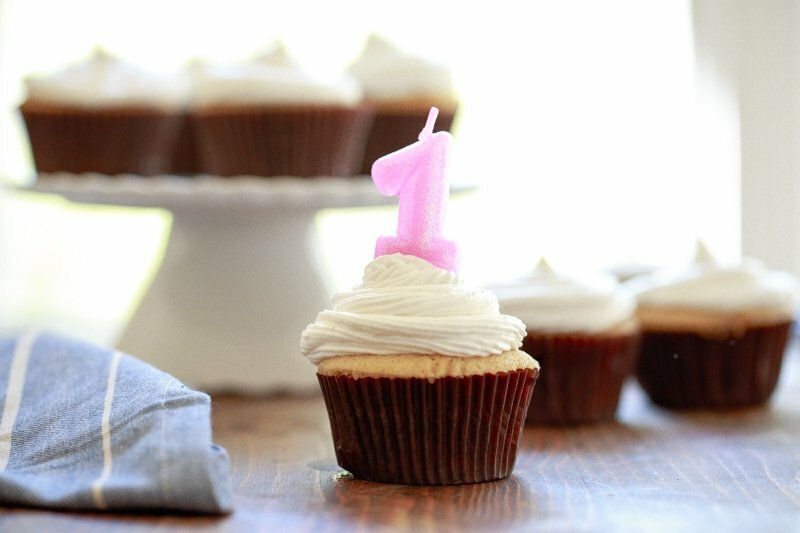 I’d like to make these for my son’s first birthday, but he can’t have dairy :( I was thinking of trying solid refined coconut oil and unsweetened almond milk, but didn’t know if you had any recommendations! Hi Cara! Oh gee, I don’t have any ideas, I’m sorry! I would try them with your alterations many weeks ahead of time so they’re just right on the big day. And let me know how it goes :) Best of luck! Can this recipe be used in a cake pan? My hubby is cutting out sugar and I think he would love these. No babies in the house but my toddler won’t eat fish! None of it. No tuna, salmon or tilapia. She will eat shrimp. But she used to be the one who would anything and everything. Now all she wants is watermelon. Go figure! I’m planning to make this for my son’s first birthday on Saturday but was hoping to do it as a mini cake instead of cupcakes. I have a 5.9 inch round cake pan… do you think the recipe as written would be the correct amount to make a cake that size? And could you approximate about bake time? Thanks for helping me brainstorm! I seriously LOVE all of your recipes and am patiently waiting for you to release a baby food/baby friendly family meals cookbook ???? I haven’t tried the recipe that way, but many have asked. Next time I make it, I will! I’m worried the cake will sink because of the maple syrup. The cupcake pan sides help it rise, but in a 6″ round cake pan, I really don’t know what the batter will do. I would make it ahead of time and test it before the big day! Let me know how it goes! Made these for a bake sale at work. Are the batter and cream supposed to be looser than usual batter and cream? Yes. I hope you enjoyed them! This cake tastes amazing! I made it in an 8 inch pan x 2 (doubled the recipe for a layered birthday cake effect) and it did NOT sink in the middle (thank the lord, since I did not have a plan B). Thanks for the recipe! Just finished baking this and it is delicious! 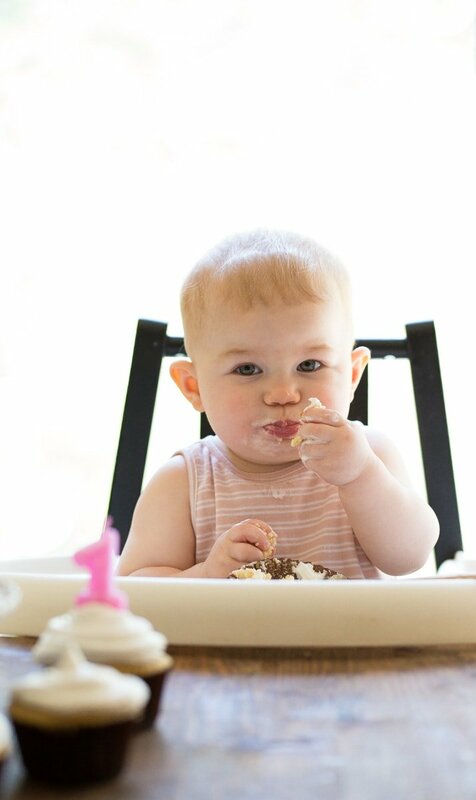 I have tried several healthy baby cakes for my daughter’s first birthday and I finally found one that works. It is delicious enough to feed to adults and healthy enough to ward off my mom guilt! I baked it in a small, 7 inch cake pan for 30 min instead of 20 and it came out perfectly – no sinking and also no bulging requiring me to trim the top for a flat cake. The taste reminds me of a delicious pancake, obviously because of the maple syrup but also the moistness and bounciness – it is a really great consistency for a cake! I’m thinking of making two layers and putting fruit in between. Thank you and Camille so much! Would it be possible to make these into a cake? Or a layer cake? Any tips on pan size or increasing amounts would be very helpful and much appreciated! Thanks! I am SO happy to have found this recipe. I want something like birthday cake for my little guy, but not over the top with refined sugar. I love your blog. Thank you! Hi!! Does this recipe only make enough for 8 cupcakes? Or is it more? Also, have you made them into mini cupcakes…if so how long should i keep them in for and should i adjust the temp? thanks!! Thank you!! I’m going to double the recipe and make my first batch as minis to see how it works! I’ve been staying away from sugar so I’m making them for my baby shower that’s tomorrow, I’m excited to try them out! I was skeptical about trying this recipe because it looked too easy! I was desperate for a sugar free bday cake substitute and found this shortly before the party. This is hands down the best cupcake recipe EVER! It’s so quick, so easy, and so delicious. Thank you for sharing! I remember seeing this when your daughter turned one, and just tested them out for my daughter’s first birthday! SO GOOD! My family is sitting here eating them hot straight out of the oven! Thank you SO MUCH! Love all of your recipes! D’AWWWWWWW well fine, the cupcakes look good enough, and the kid is cute enough, that I’ll forgive you :-) Joking! This recipe looks aces, boo! The cupcakes turned out perfectly! (Doing some test batches for my 3yo birthday). But the icing went all grainy (and tastes a bit watery, especially after being chilled more) after adding the maple syrup (I drained the cream and beat it till it was beautiful and thick, and then my maple killed it, even after just a tablespoon). Oh no, Genevieve! Thanks for making it! Oh no, I bet your maple syrup is just a tad thinner than mine. I think I mentioned this in the post, but you can sweeten with powdered sugar instead of maple syrup if you want it thicker. Would that okay? I made these in a 6 inch cake pan last weekend for my daughter’s first birthday. It took 45-50 minutes in the 6 inch pan but turned out great and the middle didn’t sink. Wanted to share for anyone else wanting to make this as a smash cake. Thanks for the recipe! Would it work to substitute honey instead of the syrup? Flavor wise do you think it would still be good? I’m making a smash cake for my daughters first tomorrow and this seems to be exactly what I’ve been looking for, but I prefer honey(and already have it in the house:p)! Delicious ! So glad I found this recipe. Just wondering how long you would say to mix the frosting? I can’t seem to make it as thick as I envisioned it would be. Is there something I can add to make it thicker? Thanks so much. You may have already answered this question, but I don’t think I saw anything about it in the comments…just wondering if I make the cupcakes the night before I serve them should I store them in he fridge or covered on the counter? Just the cupcakes-I’ll do the icing on the day. Thanks in advance for your reply! Looking forward to using your recipe! I would store them on the counter, covered. And yes, icing the day-of for sure :) Enjoy! What brand of maple syrup do you recommend for this? Yes, that work would fine :) Don’t refrigerate it, though…coconut oil hardens at cold temps. Hi there, I’m planning on making this for my daughter’s first birthday except use regular whipping cream instead of coconut cream. Will this recipe work if I make a small cake rather than cupcakes? Also will the frosting melt if left out of the fridge during the party? I’m planning on adding dots of frosting around the edge of the cake for added flair :) and ideally would like to leave it out for presentation sake on my food table. Thanks! Hi Brit. Yep, regular whipped cream will work. As for changing the pan size…I think if you scroll through the comments, many people have made this in a 6″ pan. I haven’t personally tried it, but it should work. Whipped cream frosting won’t melt if it’s cool in the room…you can always sprinkle gelatin on the cream when it’s cold before beating..that will give it some structure. AMAZING recipe (and cute child)!! I have a question; can I subtitute buttermilk for the oil and butter without it affecting the cupcakes? Thank you, in advance, for taking time to answer my question. Hi, thanks! I don’t recommend substituting anything. Buttermilk isn’t the same as oil; different fat content. And it’s a liquid, while oil and butter are a fat. I can’t guarantee results if you change 2 of the ingredients. However I have a question; I would like to subtitute buttermilk for the butter and oil, would it affect the cupcake, for instance the texture, structure or baking time? Sorry didn’t realise I posted the sam comment twice.